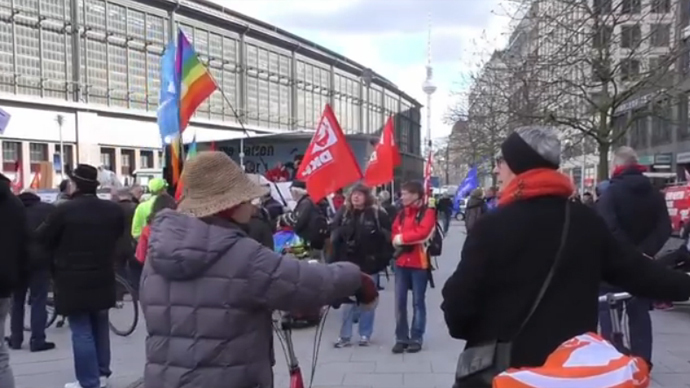 On the eve of Easter Sunday, people took to the streets of Germany in support of world peace and denouncing militarization, the arms trade and NATO’s role in conflicts around the globe. Dozens of police officers secured the rally as people marched from Dorothea-Schlegel-Platz over Friedrichstrasse and to Alexanderplatz. Banners and flags carried by the protesters made their messages clear: “North Atlantic Terrorist Organisation” read one banner. Others carried an array of flags of self-declared, unrecognized and criminalized states and organizations across the globe, struggling to get recognition from West. It included the Kurdistan Workers Party and Palestinian flags, as well as self-proclaimed insignia from self-declared republics of Donbass in the east of Ukraine. “Fascism never again – war never again,” one of their signs read. “Since the beginning of the participation of Germany in the war of aggression against the Federal Republic of Yugoslavia, there were parliamentary majorities, but never have the majority of people in Germany supported these wars. Instead there were – all the time – stable majorities against those wars,” German Peace Association speaker told the crowd. Worries about the increasing spread of jihadist ideology and threat posed by the Islamic State (ISIS) was also reflected by the crowd. The use of drone warfare and its “collateral damage” in form of innocent civilians lives was condemned as well. Activists also demanded the removal of 20 American nuclear warheads stationed at the German military airport Büchel. Calls for reconciliation with Russia over the Ukrainian conflict also persisted in the crowd. Bremen, Leipzig, Rostok, Hamburg, Hanover, Munich, Oldenburg, Stuttgart, Braunschweig Wolfsburg all witnessed parades and rallies on Saturday. Signs reading “Disarmament, not welfare cuts”, “War is never the solution” and “Our future nuclear-free” were seen across these cities. The pacifist movement in Germany plans to hold around 80 rallies during the Easter weekend nationwide.